We are counting on you to make sure your friends and family create a plan to vote. Research tells us that when you ask people if they have a plan to vote, and you help them make that plan, they show up. -Do you know where your polling location is? You can find your polling location here. -Do you know what time you are going to vote? 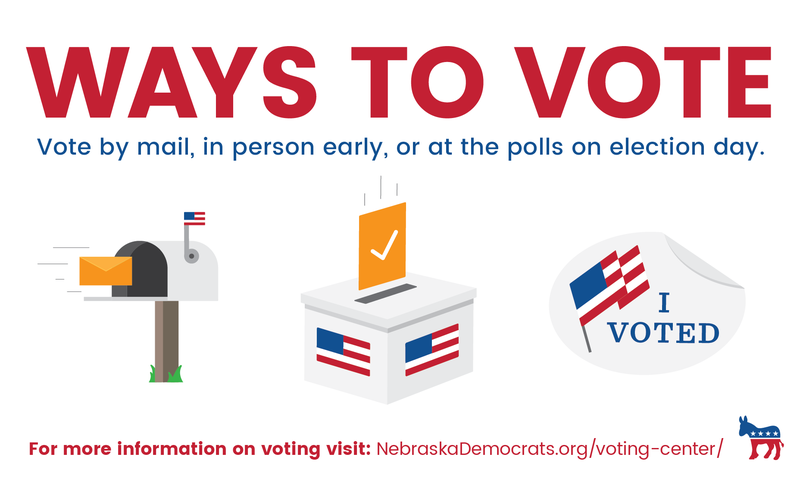 Polls are open 8am-8pm CT. Nebraska law requires employers to allow two consecutive hours for employees to vote on election day. -Do you know how you are going to get to your polling location? Many places are offering rides to the polls. -North Omaha, call Black Votes Matter at 402-312-2891. -Do you have your Voter Guide to know who all the Democratic candidates are on your local ballot? Get your Voter Guide here. Help us make sure that we are getting everyone to the polls on Election Day, Nov. 6, with all the information they need. 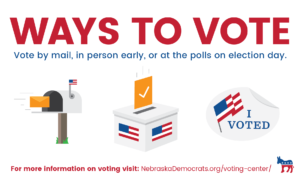 850 Democratic candidates across Nebraska are relying on you to vote. Create your plan using the questions above and go get your “I Voted” sticker on Nov. 6! Tag your photo on social media #NebDems. It is time we take a stand and end the one-party control of our state.